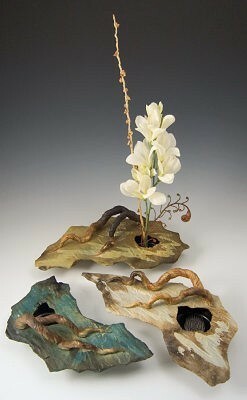 10" Ikebana vase smoke fired w/ underglaze 2"h x 10"w x 5"d Ikebana vase, carved clay slab with sculpted branches. Air brushed and smoke fired finish. Water cup with pin frog to hold flowers. Also available in 10'' and 12'' sizes in sunset colors shown, teal and green colors available.